A few drawing games I tried out last week to liven up lessons and practice co-ordination skills. There are no age or ability limitations to these games, and the more people the better (a touch of drawing rivalry makes the resulting pieces more interesting). A game that requires more than one person and especially lends itself to pub napkins. Originally invented by children across the world and then taken up by the Surrealist group who renamed it ‘Exquisite Corpse’ after their collaborative sentence “The exquisite corpse shall drink the new wine”. The drawers take it in turns to draw a section of a ‘thing’ (I usually say a monster or new species), folding back the section of paper once they’ve finished and leaving a thin strip visible for the next person to continue. Once you’ve run out of paper, unfold the group drawing and see what you’ve got. I wasn’t sure what to call this one. It simply involves the drawer sketching an object without looking at their piece of paper. If you have more than one person, they can sit opposite one another and draw each other. I held sheets of paper under my pupils’ noses to preempt peeking. This game is a really good exercise for looking and page orientation. The drawer draws a person or object without taking his/her pencil off the page. Try it out with different materials – I find biros and felt-tips lend extra confidence. Does what it says on the tin. The drawer looks at an object for 3 to 20 seconds (depending on how cruel the tutor is feeling), then draws it blindfolded. 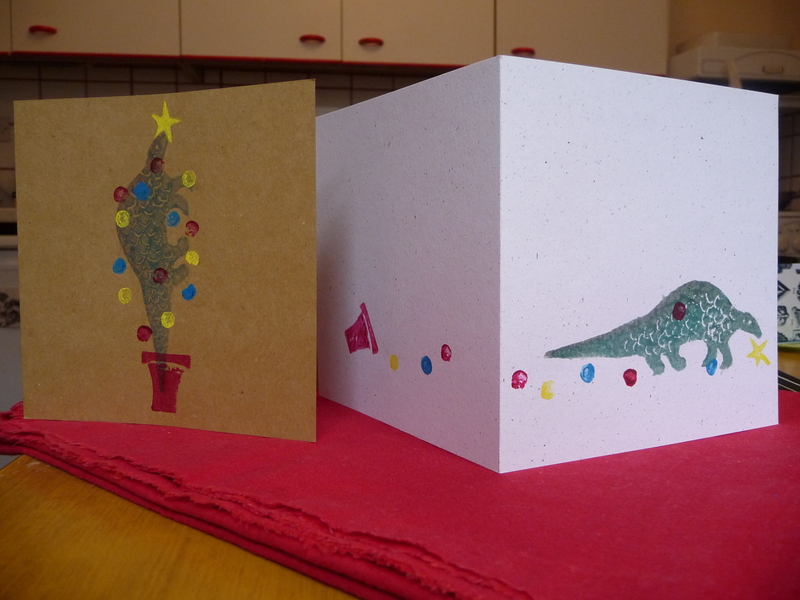 This morning I made Christmas cards. I decided that I wanted to make cards this year, but for it to be fun, as opposed to a lot of time fretting over them. So the answer.. printing.. specifically, potato printing! I made this little drawing as my starting point, based on a postcard I bought at the British Library exhibition. I thought the idea of a Christmas tree coming to life as a pangolin would be fun – these creatures do look a little bit like pine cones after all. 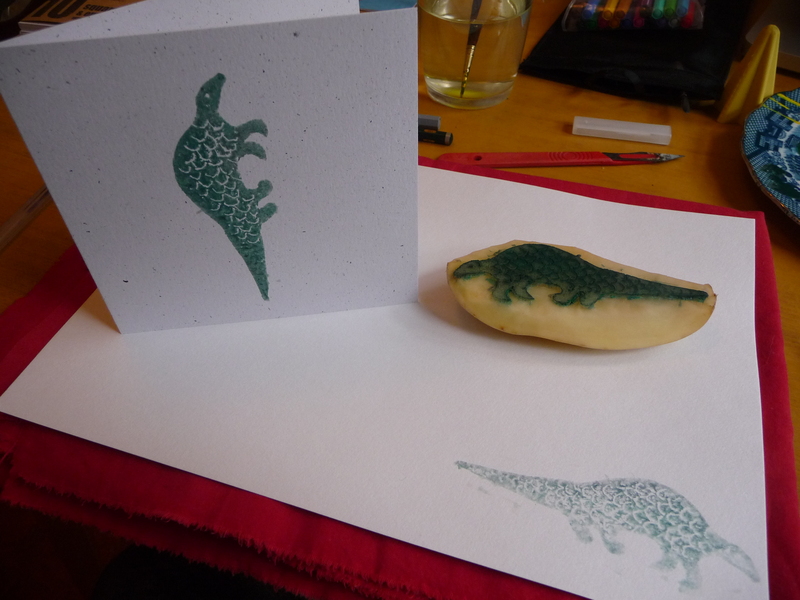 Then, I drew the pangolin outline onto a piece of paper, exactly the size I wanted to print. I used thin-ish paper, so the outline showed through when turned over. I transferred the drawing to the potato by turning the piece of paper over, putting it on the cut surface of the potato and pricking the outline through with a pin. When I took the paper off again, the pinpricks were barely visible, so I used a paintbrush to apply a thin wash of colour to the potato cut surface to ‘bring out’ the design. I then used a scalpel to cut out the outline and cut away a layer of potato from the edge. This bit’s fiddly, and worth taking time over. You need to make sure there are no little pieces left in the gaps, because these will accumulate paint, giving a smudgy outline. Details of eyes, nose and scales were done just by making cuts, not by lifting any pieces out – potato prints can give a surprising amount of detail. 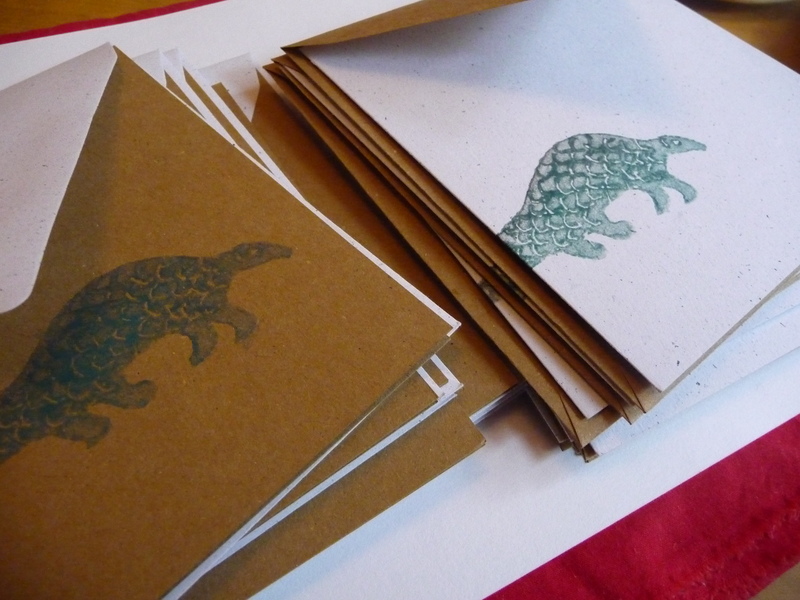 Then, I printed onto the cards, playing around with pangolin placement. 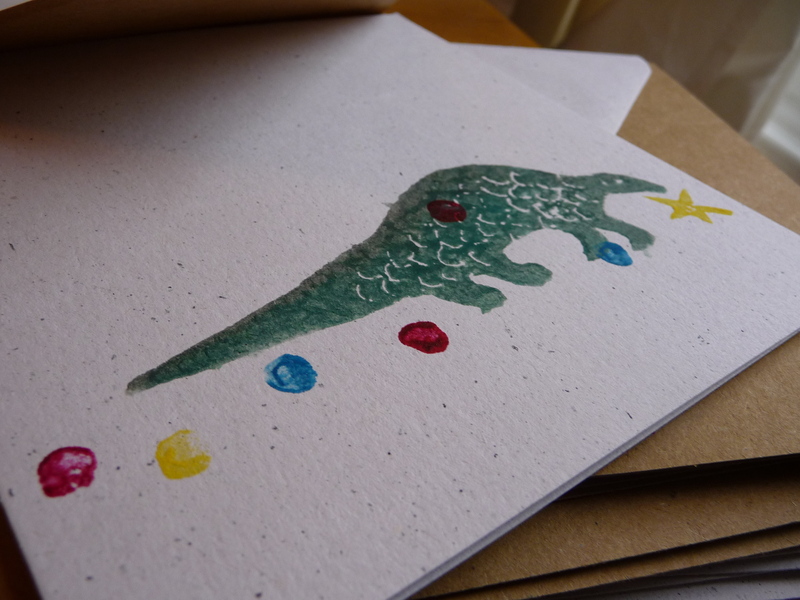 Next, some colour in the shape of some baubles, a star, and a Xmas tree bucket. Finished! Well, apart from the finishing touch, with the glitter glue. Trust me, it’ll work. 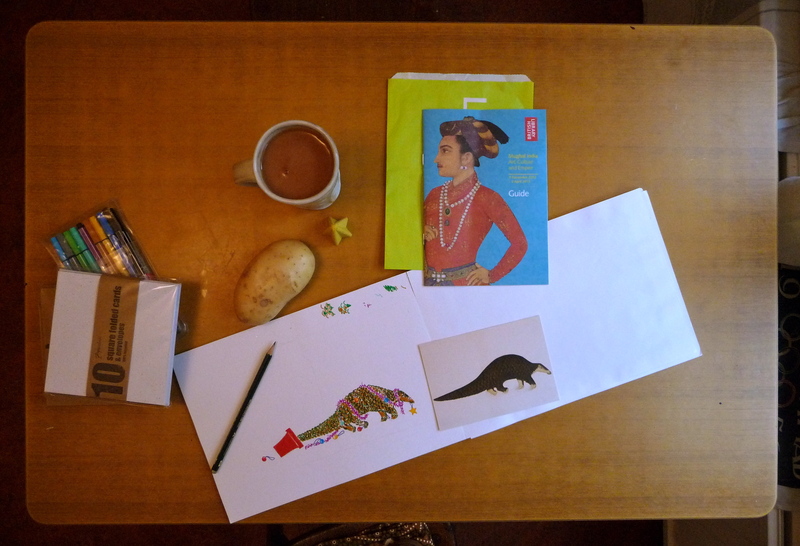 On Sunday we went to see Mughal India: Art, Culture and Empire at the British Library. The dozens of vivid, excruciatingly finely detailed miniature paintings on display would have originally been made only for the eyes of a select few at the royal court. Which is why it’s all the more special to see them today, along with thousands of other visitors (although it wasn’t that busy when we were there!). I particularly liked one eighteenth-century painting of a pangolin by Shaikh Zain al-Din. 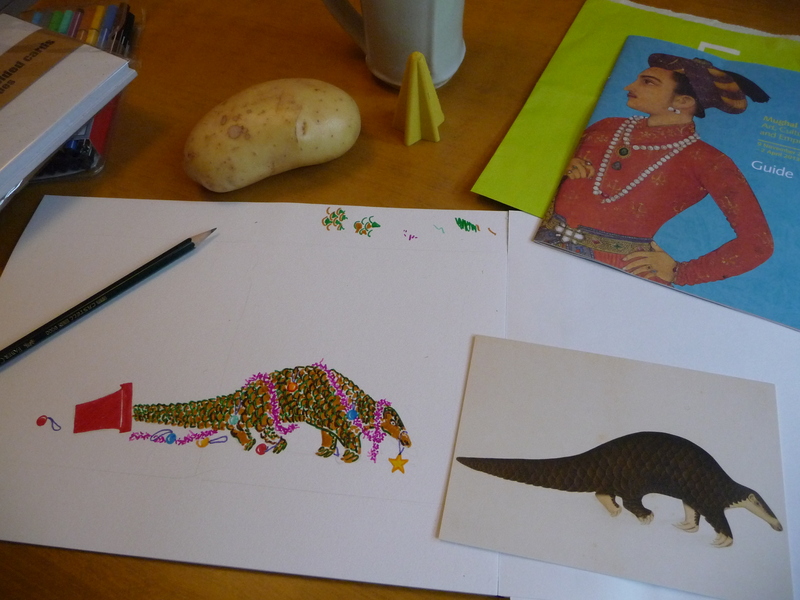 It inspired a (slightly less) lavish idea for homemade pangolin Xmas cards. Stay tuned..
At the weekend Sayed and I went to visit friends in Exeter. We had a great time there, visiting the beach, playing and singing with their sweet little boy. But, I have to say, one of my favourite bits was our productive three-hour train journey there, me knitting, Sayed drawing. Here are a few photos. 1. New fairisle glove project. 2. & 3. Knitting. 4. One messy train table. 5. One talented illustrator (and photographer). 6. Sporting his new jumper. 7. Beautiful light on a fresh drawing.